Here are some of the new licence improvements from the latest release, KB+ R5. 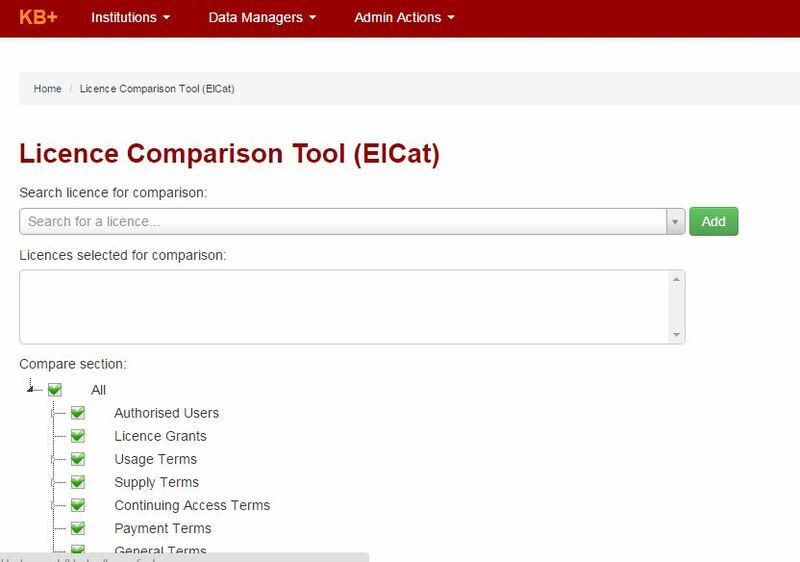 These comparison tools can be useful for example when comparing new and old licences to check for changes or helping answer queries about what different licences permit. There are new Export options to both individual and a list of licences. You can export the titles associated with a licence or the licensed subscription/package or the licence itself including the licence properties. When you click on a licence you now see the licence properties first, this was changed in response to feedback about showing the most commonly used information first. 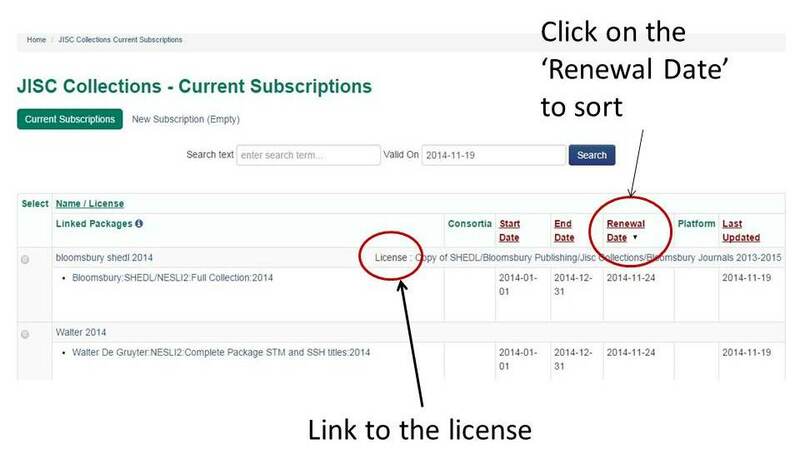 It is also now possible to Link to a subscription from the licence screen as well as copying a licence from the licence details screen rather than going back to the licence list. The aim of these improvements was to help get to the data you need more effectively as well as streamlining workflows. For more details about the new features in KB+ R5 please watch the 10min screencast. Take a look at this 10 min screencast covering some of the exciting new features of our latest release. ​We are running a workshop to gather feedback on a new development for KB+ R5 which is intended to manage estimated and actual subscription costs at a variety of levels. From the start , libraries have flagged the potential for KB+ to include an appropriate level of financial data relating to subscriptions. Having established the baseline operational service and significant integration with JUSP, in 2014 Jisc Collections worked with the user community to revisit the potential for delivering the ‘magic triangle’ of subscribed entitlement, usage and cost data in one place. This workshop will provide opportunity for user input to the initial Release 5 development, which is intended to manage estimated and actual subscription costs at a variety of levels. In order to help libraries in identifying likely workflows, related issues and further requirements, the development team will have a prototype cost management interface to demonstrate using real library data. Do we have the right data items, categories and filters? When and how will libraries use this application? What review forms, reports and exports will be valued? You can view our webinar recording about the latest release of KB+. Click here for the recording which is available on Blackboard collaborate and is approx. 60 mins. In this webinar I highlight new features in KB+ such as editable license properties, new fields in the subscription record and the package comparison tool using screenshots and example scenarios of use. I am pleased to see a number of new enhancements, resulting from the workshops we ran earlier this year, in todays release of KB+ 4.2. In addition there have also been some small changes to improve the general layout of information on the screen across the system improving usability. Licences – New functionality includes the ability to add new ‘licence properties’. Institutions can now record the information they want to include in the licence details and if it is not already on the provided list they can simply add it. For example a new property we have included is ‘Signed’ allowing institutions to record whether the licence has been signed locally or not. These properties can also be searched allowing institutions to find all the licences, for example, awaiting signature or all the licences which can be used to supply ILL requests. The layout of the information has also been improved making it more intuitive, for example the ‘linked subscriptions’ are displayed clearly indicating which subscriptions fall under each licence. The options for adding a licence, either by copying a template or creating a blank licence are also now much clearer. 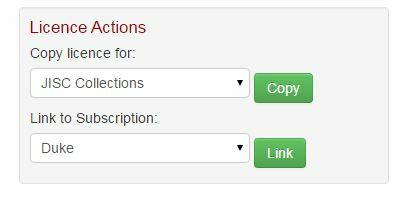 Subscriptions – New functionality includes the addition of a ‘Manual Renewal Date’ for subscriptions, with the ability to sort subscriptions by this date to see upcoming renewals. 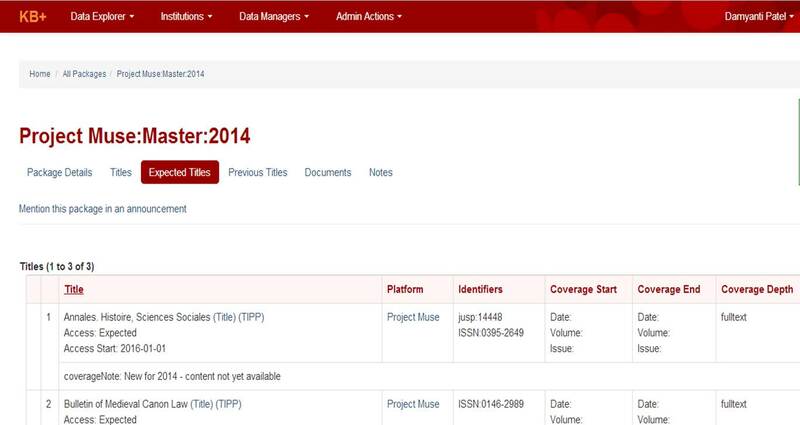 We hope the ability to sort by this date will help in managing the workflows around renewals. Search – New functionality includes the introduction of a one click access to a quick simple search. Click on the search icon in the top right hand corner of the screen to do a search across packages, title, platforms and organisations in KB+. The existing search for packages and titles via the “All packages” and “All titles” options has also been improved on in terms of scope and usability. Package Comparison – This new tool, Package Comparison, provides institutions with the option to compare packages and subscriptions, including the ability to compare the contents of a single package or subscription on two different dates to see what titles joined or left the package/subscription during that period. This builds on the introduction of access start and end dates in the last release which allowed datamangers to include the date of when titles joined or left a package. This tool could be used to compare two packages for example, Wiley Full Collection 2012-2014 package with the Wiley Full Collection 2015-2017. You can select the date on which to compare to for each package and use the filters to see which titles have been amended, joined or left with a coverage note indicating the reason. This could be used to follow up any queries with the publisher, help with renewal decisions etc. You can also export the list that is created. Over the next week we will be updating all our user guides and screencasts. We will also create new user guides and be running an online webinar to cover the new functionality. Thank you to all the institutions who have provided valuable feedback during this process and we look forward to our continuing collaboration and developing a service that meets the needs of the community. Please do contact us if you require any further information. In the recent release of KB+ 4.1 we introduced some new functionality surrounding Multi-Year packages and Master title lists. There will be one title list (package) for the duration of multi-year deals this will be updated as titles join or leave the package (eg title transfers between publishers). For these packages you will no longer need to follow the renewal process of uploading a new list each year which we hope will save time and help reduce confusion. We now have over 1000 packages and 20,000+ title in KB+. A key objective is to ensure this data is up to date and accurate. 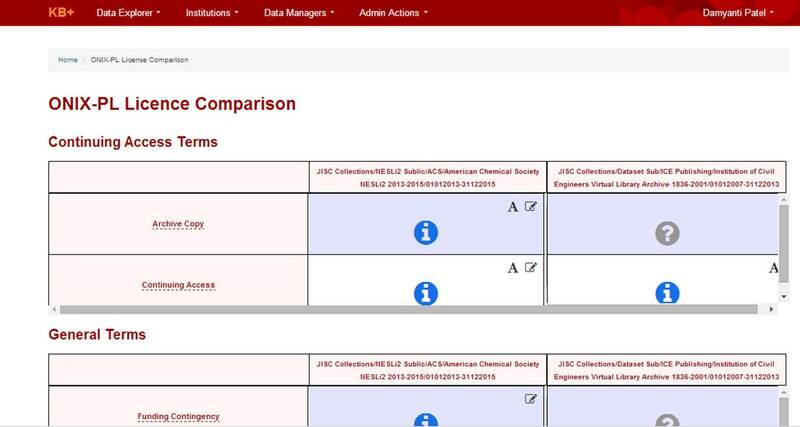 With a single list to manage the data managers will be able to maintain a level of accuracy and respond to emerging new requirements such as tracking APC journals. Where you have subscriptions linked to a multi year or master list the functionality remains the same aside from a new basic & advanced view and a new set of “start access” and “end access” dates which you can use to manage your subscription. From the advanced view you will be able to see which titles are ‘expected’ to join and which titles have left, ‘previous”, the package. If you have created one subscription per year for a multi-year agreements you can convert your most recent subscription by updating the “End Date” to match the end date of the agreement and continue to use. If you have added various annual packages for the same agreement to the same subscription you will have two different views of the same package in a single subscription. It would therefore be simpler to create a new subscription linking it to the latest package. For Multi Year packages you will no longer need to follow the renewal process as the title list will be continually updated. All the changes will be announced as a ‘To Do’ on your dashboard and subscription page. Please contact us at kbplus@jisc-collections.ac.uk if you have any further questions or require a previous year list of a Multi Year package. We expect the ability to interrogate KB+ to know the content of a package at any given time to be available in the next release, until then you can request a previous year list of a multi year package from us directly. With a new release comes a number of fixes and new functionality, including some of those identified in our focus groups early this year. In renaming this menu we hope this helps navigating KB+ and locating necessary information easily. From this menu you can search across KB+ as well as go directly to your subscriptions, license etc. There will be one title list (package) for the duration of multi-year deals this will be updated as titles join or leave the package (eg title transfers between publishers). For these packages you will no longer need to follow the renewal process of uploading a new list each year which we hope will save time and help reduce confusion. We will be updating the title list as information becomes available; addition of new titles, adding ends dates and coverage notes for title changes, cessations and transfers. In 4.1 you now have an enhanced view of these title list allowing you to see titles have been removed from a package and which are expected to join a package. As previously we recommend subscribing to the announcements and dealing with ‘To Dos’ as they arise in order to track all changes. 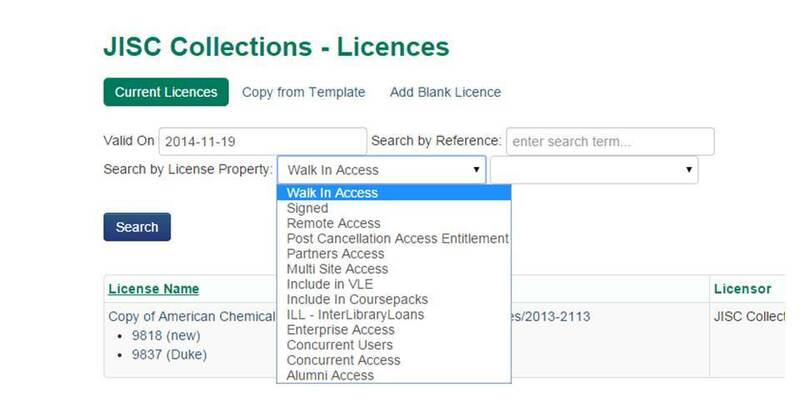 Under the ‘Institutions’ menu you have the option for ONIX-PL Licence Comparison, you can pick a primary licence as the basis of the comparison, then compare one or more other licences. The comparison compares all parts of the ONIX-PL licence and includes the ability to display the relevant licence text and annotations. We will be updating our help documentation and adding new user guides shortly.